Don’t fall the ‘ol “Highest Quality, Lowest Price” gag. We all know you get what you pay for! A recent development in the Retail Tobacco Industry is a company that once sold tobacco fixtures to Big Tobacco Companies, who in turn provided the fixtures for free or reduced prices, is now selling these fixtures directly to Tobacco Retailers. This has brought a flood of inexpensively built tobacco fixtures into the marketplace. We often receive calls from Tobacco Retailers asking for price quotes on our Custom Metal Frame Fixtures in order to compare pricing with a quote they have received from this other company. Now, don’t misunderstand me. We encourage shopping comparatively and checking prices. However, this recent development has made us take a step back and consider this question, “Are all tobacco fixtures created equal?” Our conclusion…they are not. To compete solely on price our competitors must cut corners somewhere, thus, lessening the quality of the product. Consider this…what type of product would a company offer, who has been pressured by Big Tobacco to develop a product at the lowest cost possible so that it can be given away for free? The lead time was exceptionally long. The unit came fully assembled, however, it was difficult to maneuver into our facility due to it’s cumbersome size. The unit was shipped on it’s back and upon standing up we immediately noticed that the pusher rattled. Further inspection of the pushers revealed that the pusher and spring mechanisms were very loose, and made of thinly molded plastic and had a light gauge spring. The metal frame consisted of thin gauge metal. Overall, the price of the unit was reflected in the quality of the unit. Our metal frames are fully welded and powder coated for durability. Our pushers are made of thick molded plastic for longevity. Our springs are medium gauge to hold up under constant use. Our pushers are solid with very little “loose” side-to-side movement in the paddle and spring mechanism eliminating product twisting of failing to push forward. Our units are very easy to move, assemble and install (see testimonial below). Our units are very simple to adjust and customize after installation. Our units are extremely flexible and easy adapt to new products and sales trends in the ever changing tobacco industry. Our Metal Frame Tobacco Fixtures may not be the cheapest in the industry, but our freight rates are the lowest, our lead time for production is the fastest and the quality of our product will last for years enabling you to get the highest Return on your Investment. Our fixtures have been field-tested for over 10 years in national chains and independents. Our fixtures are currently in thousands of retail outlets, including major chains and independents. 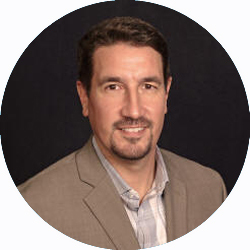 Our fixtures will allow retrofitting to accommodate potential FDA regulations, new product introductions and new technology. Our fixtures can be reconfigured to include OTP or expand OTP in current sets including e-cigarettes and vape products. Our fixtures have been reviewed and approved for use by Altria. We can manage the installation of our fixtures nationwide. Our staff will work closely with you, ensuring your changing needs are addressed in areas such as signage, lighting and new product display. We have been the leading online distributor of tobacco fixtures for over 13 years and have the infrastructure in place to support your display needs for the long term with an extensive and proven replacement parts program including a 1-year limited warranty. When it comes to making an INVESTMENT in a Tobacco Fixture and Merchandising System our Metal Frame Fixtures are the best total option. So, if you find yourself shopping price please consider quality, lead-time, freight costs, flexibility and the support after the sale as well. 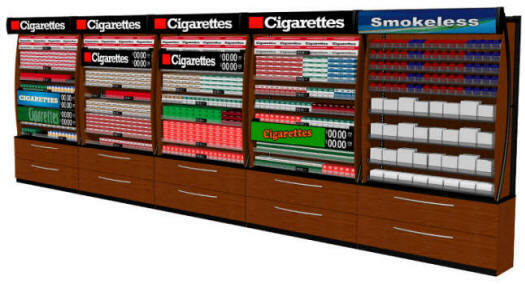 TheCstoreEstore.com has the largest selection of Cigarette Displays and Tobacco Fixtures including attractive wall units with ultimate flexibility, clear signage for bold brand graphics and most importantly optimum product placement. Our fixtures accommodate cigarette packs, cartons, snuff, snus, cigars, e-cigs and all other tobacco products and accessories. Consider us a partner helping you to select the right tobacco fixture that will fit your budget and meet your sales goals for your tobacco related products. Click here to learn how to get a Section 179 tax deduction for your investment. We recently had a customer in Punta Gorda, Florida who had previously purchased another company’s tobacco fixture for one of his stores. He was not happy with the unit, so when it came time to order a fixture for his second store he opted to purchase one of our 5′ wide Custom Metal Frame Tobacco Fixtures. However, because of the difficulty he had installing the other company’s fixtures in his first store he requested that we provide him installation services along with our tobacco fixture. We arranged for the unit to be professionally installed per his request. 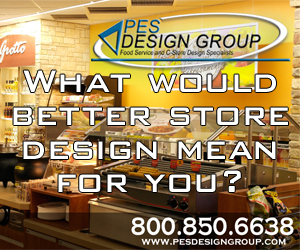 However, once our fixture arrived at the his store he immediately called us to cancel the installation after realizing how simple our fixtures were to install. He quickly installed the unit himself and called to say he was very pleased.